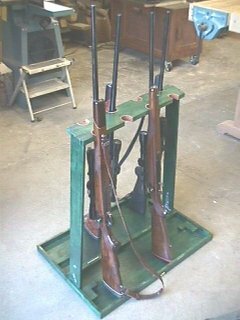 This simple field rifle rack idea has been around for ages. I have no idea where it originated, probably Europe or Africa where hunting parties were accustomed to the finest in equipment and accomodations. It doesn't hurt to have scored of bearers to carry all that stuff around. I have no idea where one buys such a rack, every one that I've seen was apparently home built. This is my adaptation of the design and I've found that it works well. If you would like to build your own you will find a link to downloadable plans at the bottom of this page. The rack will hold up to eight rifles or shotguns at on time. When unfolded it is quite stable. I built it using scraps of Alder. The top and bottom panels are 1/4" Baltic Birch plywood. The barrel sockets are lined with strips of leather to protect the firearms. The finish is Hunter Green stain. Here you see the entire rack closed like a suitcase. 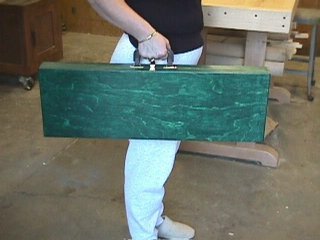 When closed it measures a mere 2-3/4" x 10" x 29" and weighs just a few pounds. It is small enough to toss in your trunk for trip to the gun range, or stow in your 4 x 4 for an expedition to Wyoming. If you would like to build your own Field Rifle Rack, click on the link below to download the plans. You will need the free Acrobat Reader, but you won't find it here. Get it at the Adobe web site. There is no charge for these plans, you are welcome to take them with my compliments. I don't support them either, but you can email me with questions and I'll help as much as time allows. I would appreciate an email note, just so I will have an idea how many go out. Have fun. Problems viewing??? These plans are a large file and some systems may not be able to display the plans in your browser. If you have problems, try downloading the plans to your local computer and then opening them from your local disk. PC users can RIGHT CLICK on the link above and choose SAVE TARGET. It's a bit different for Mac users, but you get the idea.